FREE SHIPPING on orders $25 and up for all orders in the U.S. including Alaska and Hawaii. A $5 Flat Small order and shipping fee will be added to all retail orders less than $25. ZNETSHOWS uses UPS and the Postal Service for most of our shipping needs. For customers in the U.S. including Alaska and Hawaii, we have a Budget Shipping option of only $7.99 for any order of any size. Everyone else will pay actual shipping fees. We do not have any handling charges. Once you check-out after shopping online, a list of the carriers and their services are displayed for your selection. Our first step in processing orders is verifying the customer's credit card information. If the credit card and the billing address match those provided by your bank, we know that the charge is coming from the owner of the card. This way we can help protect against credit card fraud. Rates in the continental United States can be verified online on the shipper's websites. Most, if not all, of the packages can be tracked using the tracking number that we provide in the final invoice notice e-mail. We ship internationally to the UK, Canada, Australia, and Europe with Standard, Air or Express services of the United States Postal Service. However, you may request any other type of shipping method. Please keep in mind that you will be responsible for any and all fees for shipping, insurance, tariffs, import duties and customs processing. 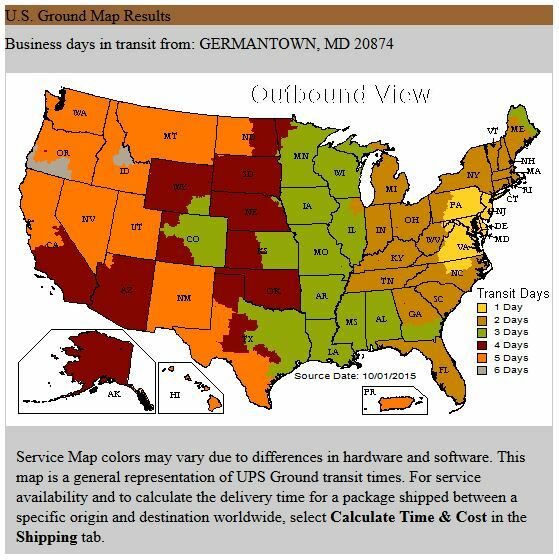 For your reference, the map below shows the shipping transit times for UPS Ground from our Maryland warehouse to anywhere in the United States. This is for reference purposes only and may be outdated. For exact transit times, please refer to the UPS website.